I DIDN'T START THIS WAR, BUT I CAN END IT. I want my kids to grow up with a sandbox and swing set in our backyard. I picture my son having a collection of G.I. Joes that his mother and I often remind him to pick up from around the house. My daughter will most likely carry a Barbie (or the more relevant equivalent for her time) by her side for a good season of her young life. In my world, it would be unjust for my kid to go without their favorite toy or grow up without a family dog or neighbors to play with after school. Sadly enough, there are children just like ours in other parts of the world that aren't afforded Barbies and sandboxes. From a young age, their dreams of toys and family life are replaced by an AK-47 and war. Throughout my day, their stories will ring in my ear: stories of children, just like the ones I will soon raise, being forced into mine fields ahead of the rest and trained to kill their families and childhood friends. It's the fact that they exist that demands me to make a choice. I didn't take their toys and give them a gun. I didn't conscript these kids. I didn't start this war...but I can help end it. 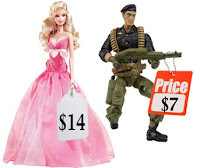 For the average price of a Barbie ($14), I can feed, nurture or educate a former child soldier for 2 weeks. For the average price of a childhood toy, I can decide whether a child will be a kid or a killer. I didn't start this war, but I can help end it.